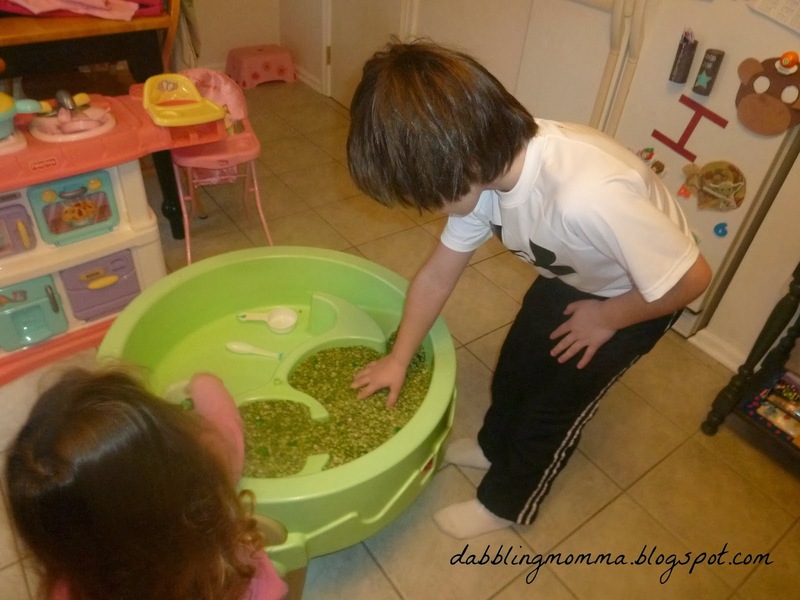 I was inspired by Munchkin and Bean when I read about their St. Patrick's Day Sensory bin. 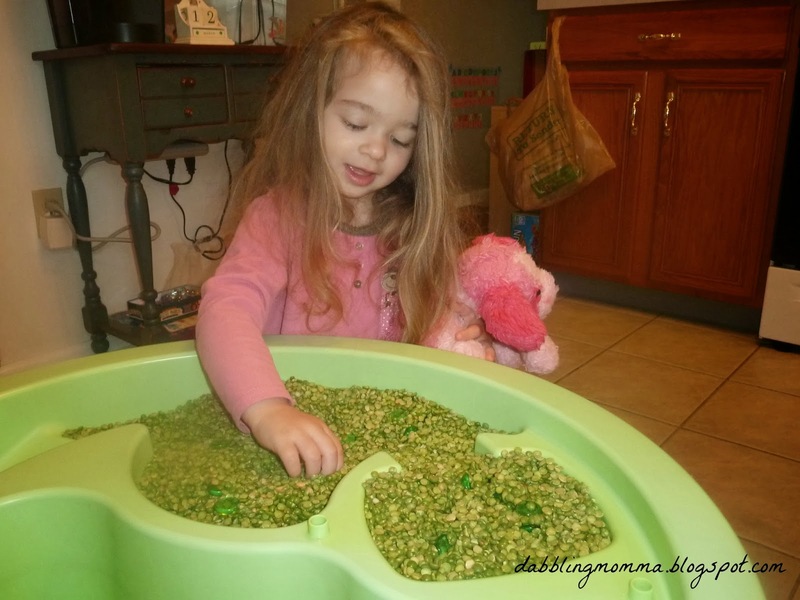 We've never played with green split peas until now so I was excited to see what Tiffany would make of it. 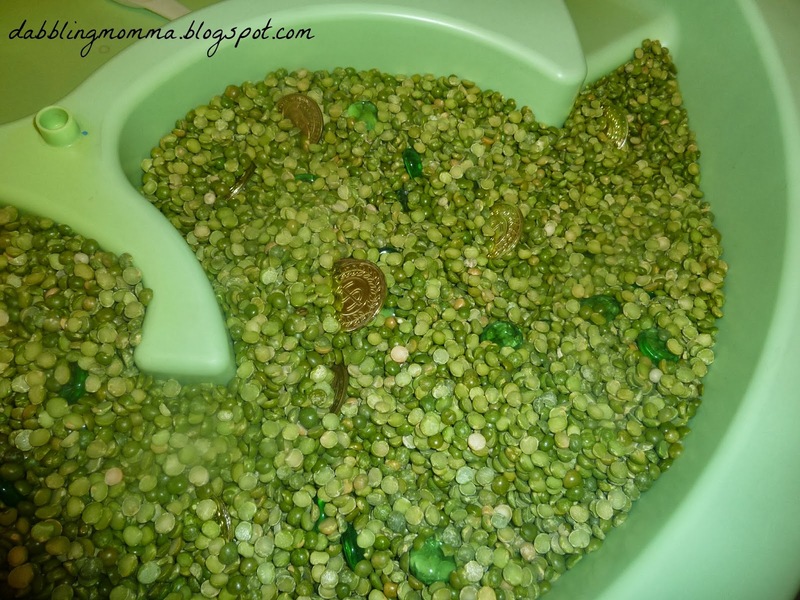 Almost immediately after reading Munchkin and Bean's blog post I purchased 5 bags of green split peas and a few extras because we were going to be using our water table. Next on the list, gold coins but after not finding them at the Dollar store or any of our local grocery stores I decided to buy some green gems I spotted at the Dollar Tree. 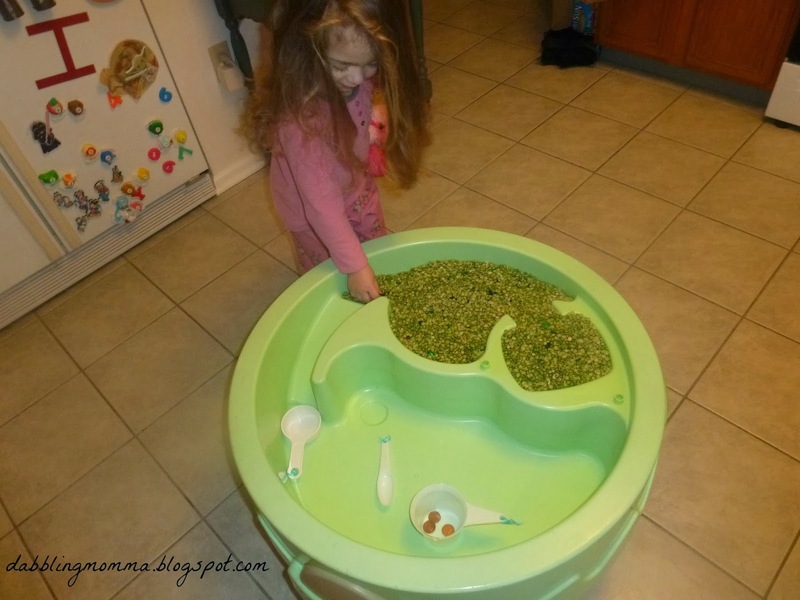 Initially, I set up the sensory table with just the peas and the green gems. Since I wanted to include coins in the some way I remembered we had some play coins so I threw in a few play pennies. My son has always liked pirates so I looked through his room and was able to find some gold coins....score! Finally, the table was set up the way I had hoped! 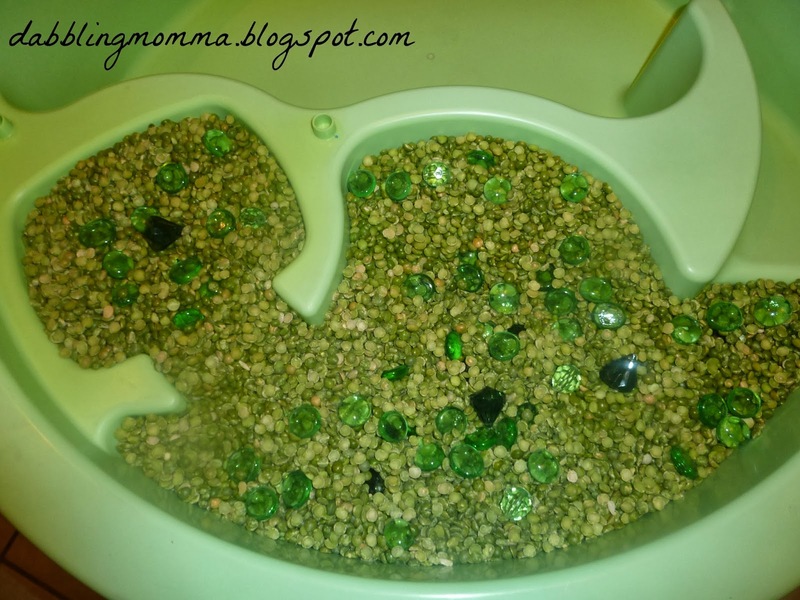 This is a picture of just the beans and green gems. And finally, with the gold coins! I liked how all 3 looked but was happiest with the coins included. Thankfully, I found some because that is what kept my daughter's attention. She was happy to find the gems but finding the coins was her highlight. She even asked if I could bury some more and thankfully I was able to scrounge up a few more from my son's pirate collection! 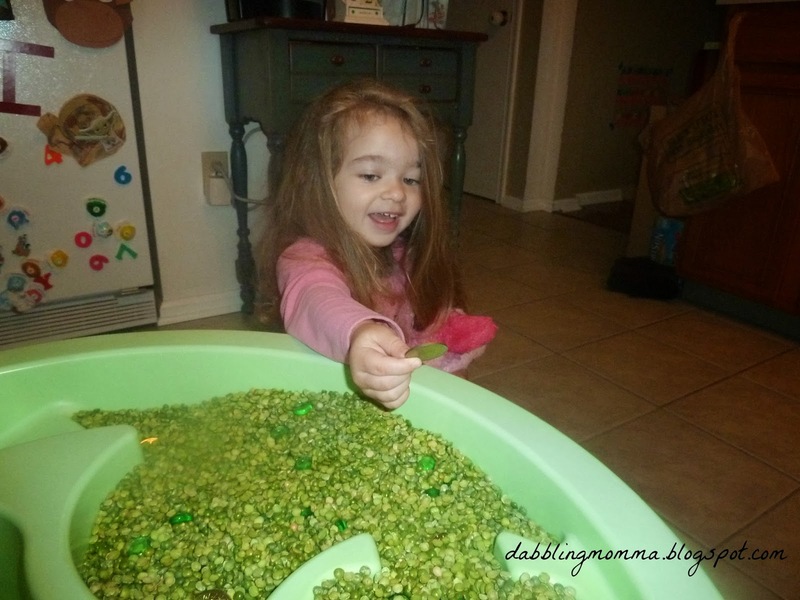 My daughter was excited to find her St. Patrick's Day sensory table when she woke up. I almost wished she hadn't spotted it until after we took my son to school because getting her to stop playing after about 30 minutes was not easy. Normally, that would be a great thing but school was calling!! My son had to feel around a bit too! Finding her first gold coin! 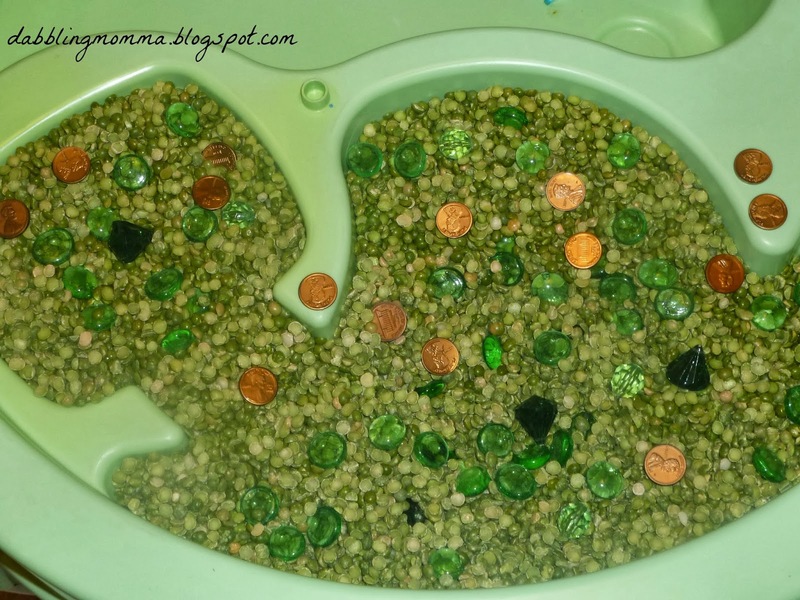 A fun and mess free sensory activity to celebrate St. Patrick's Day!